A first hockey post from me then. It’s taken a while, I’m not sure why. News came to me about the sacking of star winger. 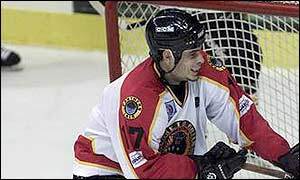 Pierre-Claude Drouin, the classy French-Canadian veteran currently icing for the Nottingham Panthers. I’m not really in a position to comment about his form in a Panthers jersey since his return as I’ve not seen him play this time around. 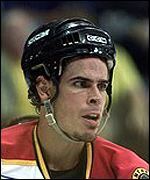 I was however a season ticket holder when he last graced the National Ice Centre though and watched his stellar play in the black-and-gold with not a little admiration. I’m pretty shocked to hear about his sacking – unlike Pierre-Claude himself according to the Post who seemed to realise that the price of his wage was more important to the Nottingham club. I’ve a good few reliable ‘eye and ears’ at that stadium and they tell me that he had been playing on a line minimal point point production between them and having to cover for rushing defencemen who were continually out of position on the plays. I might say that Drouin is as talented as practically any player I’ve seen in a Panthers uniform. That’s saying quite something considering the likes of the NHL players such as Nick Boynton who have appeared for the famous old team. I just don’t believe his ability and fitness has deserted him at thirty-three years old. He has excellent stick-handling skills, a strong shot, and slick moves one-on-one on the goalie. He can also use his good size to effect with a decent hit and toughness and also has excellent vision around the ice. This man is the real thing. As good as it has ever got in the modern era of UK hockey. Something concerns me about this move to get rid of him – doesn’t ring true to me and I wonder if there’s a little meddling in team affairs going on.. The club now has a few dollars to spend on a replacement (or two) but I don’t think they will find it easy replacing such a hockey player. It must worry the Panthers fans that the club are putting out the message that they are ‘searching worldwide’ (please!) for a player to ‘win them the league’. Perhaps they need to persuade Gretzky out of retirement and see if he will ice for two bob a week! Anybody ever heard that hoary old cliche about one player not making a team? Good luck Pierre-Claude – wherever you wash up next.